At our practice, we care about your whole health, and offering a variety of services and techniques that can help you achieve your goals is something we strive for. We’re proud to include an Active Trac Spinal Decompression table in our practice—the perfect way to stretch and decompress your spine! What is the Active Trac Table? The Active Trac table is a comfortable piece of equipment that allows the patient to lay down and relax while the spinal discs are distracted, helping to create negative pressure and better mobilize the surrounding tissues and spinal joints. A spinal disc has minimal, sometimes even zero, blood supply when it’s under pressure from gravity. When this happens, an injured disc loses water content, causing it to degenerate over time. As we’re able to address this with therapy, reduced pressure on the spinal cord helps to promote healing and strength. The Active Trac table is among the most highly advanced decompression tables available today and features the largest range of therapy techniques available for patients of all walks of life. The table can be easily adjusted to fit the patient perfectly. We often recommend patients experience the benefits of spinal decompression therapy alongside chiropractic adjustments, but the needs of each individual are unique. We’ll let you know if we think you’re a candidate for care! What Does Spinal Decompression Help? 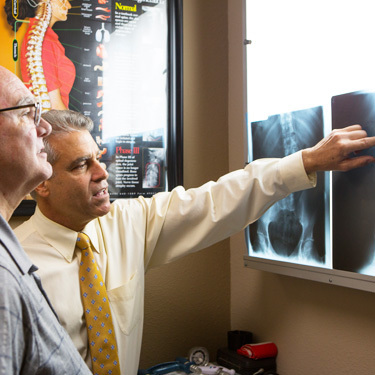 Spinal decompression therapy can help a multitude of issues, including bulging or herniated discs, degenerative disc disease, low back pain, facet syndrome, spinal stenosis, neck pain, headaches and even sciatica. The best part? It’s a natural solution to alternatives like surgery or excessive use of pain medication. Would you like to learn more about our spinal decompression table and how it can help you on your journey to natural health? We’d love to see you in our practice soon—contact us today to book your visit.